so despite my long hours during the week, i have been trying to continue cooking homemade meals as often as possible. 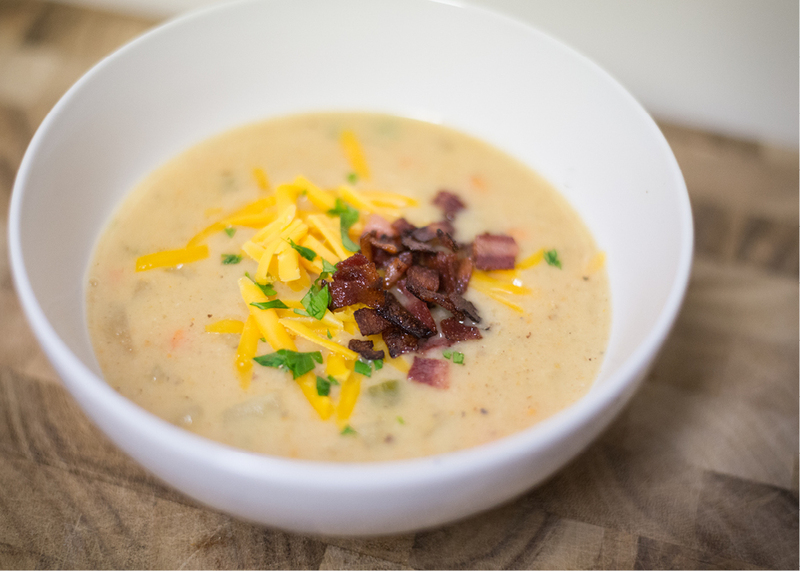 last week i made a wonderful potato soup that i will be sharing with you today! i found this recipe via the pioneer woman, a very trustworthy source!! i've never made this sort of creamy potato soup before, but i loved it & mark went back for seconds...and thirds. that's got to say something, right! if you love baked potatoes you will die for this soup! it tasted just like a baked potato to me, but so much better - considering i don't really care for actual baked potatoes...am i crazy? maybe. but this soup is just delightful. 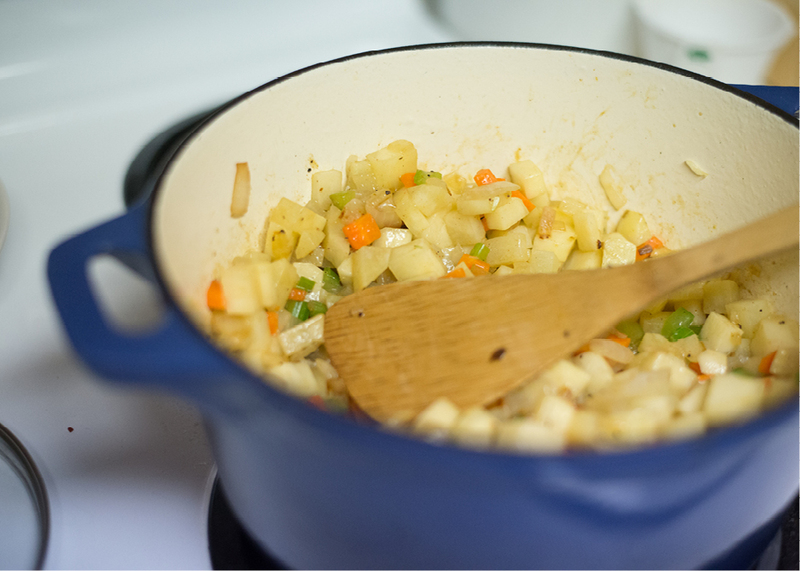 2. add diced onions, carrots & celery to the pot where the bacon was cooked. cook for 2 minutes. then add the diced potatoes, salt, pepper & cajun seasoning. cook for 5 more minutes. 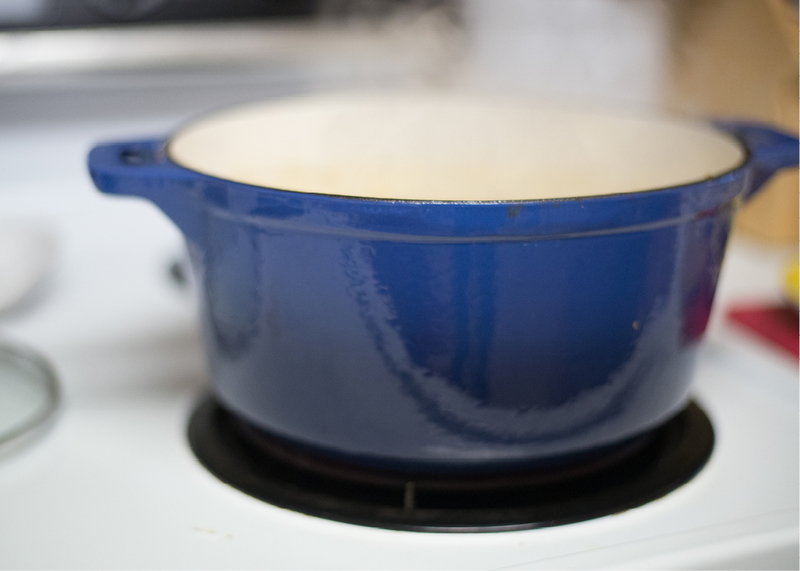 3. pour in the broth & bring to a gentle boil. allow to cook for 10 minutes, or until the potatoes are slightly tender. 4. mix the milk & flour together. pour mixture into the soup & stir. allow to cook for another 5 minutes or so. 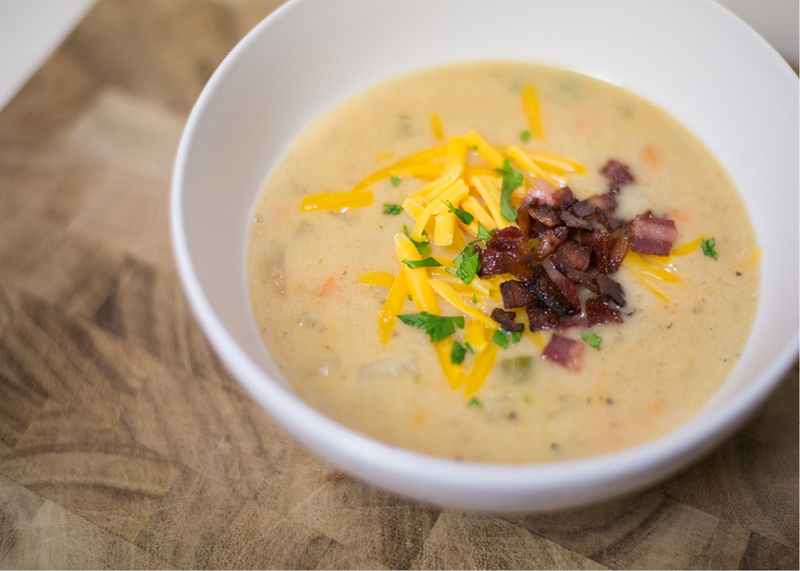 >> at this point you will have a creamy soup with some chunks of potato & other veggies. if you don't like a chunky soup then just blend all of it! or if you want more chunks, blend less of it. 6. check the seasoning & add more salt/pepper if desired. finally, add the heavy cream & parsley, reserve some for garnish. 7. serve into individual bowls & top with cheese, a pinch of parsley & a sprinkle of those yummy bacon bits! yum, I really want to make this! gorgeous pics as always! Oh gosh it looks so delicious ! and the pictures look awesome , wow you are a really good photograph ! thanks for your comment on my blog , i'm sure going to follow yours, it is so pretty and you look really sweet ! you always make the best food! mark is one lucky guy :) i'm excited to have this recipe! thanks jenna! haha thanks whitney! let me know if you like it. oh my goodness! Your blog is amazing! Thanks for the comment love! Totally following you! looks delicious! i must try this! Looks so good. I love absolutely any soup. Can't wait to try it out for myself. if you love soup, you'll love this! thanks for stopping by, leanne. We love your blog! Would you like to follow each other? that looks absurdly delicious!! definitely going to try this. i wish i had some left!! This looks so yummy! Nothing beats soup on a wintery day! The soup looks delish. My goal is to cook from the scratch as well. I never liked the idea of cooking but recent months I really feel inspired. mmmm yummy! I just happened on your blog and I'm TOTALLY going to be using a lot of your recipes! I just followed you too! can't wait to see some more posts from you! have a wonderful day, lovely lady! Yuuummmm!!! This looks absolutely delicious! I need to try this because I love potato soup. I have a question! I've been doing photography for years using natural light (mostly outside.) I'm struggling with inside pictures still. It seems that I can never get the white balance right, and my pictures are always tinted. Do you use a flash or do you have plenty of light to work with? Your inside photos are always great! hey! i don't typically use flash when i'm taking pictures inside. i just crank up my ISO a ton! when i'm taking pictures of food i am in my kitchen and it is usually night time. i only have the light of my kitchen but it seems to be enough. with the crepe pictures it was in the morning so the WB was easier to figure out because i had natural light coming in. most of my pictures do have a warm/yellow tone to them so i edit them a bit to get a cooler WB! what camera do you use again????? That's exactly what I do! Daytime pictures are a breeze, but I struggle more when I do not have natural light. I use a Canon 7D! Yum, I love potato soup, thanks so much for sharing your recipe and the pics too, I'm a very visual person and it helps for me to see the end product. I have to admit that your work is absolutely astonishing. Vibrant colors and great composition. I am sure your clients are absolutely happy"
Fashion photographer in boston ma.